“La Noche en Blanco” turns Málaga city into that blank canvas. A night of culture, music, free entry to the museums, concerts in the streets, hundreds of events to choose from between 8pm and 2am and still later into the small hours. Often mis-translated by extranjeros (even including eminent bloggers!) as “the White Night” it is something more subtle and hard to translate. The “headline” explanation is that it means “a sleepless night”, which echoes La Nuit Blanche in Paris. But clever wordplay hints at other meanings too. To vote “en blanco” is an option in many countries (for example in Bolivia “voto en blanco” is printed on voting slips. In Spain, where voting is done by choosing a slip of paper printed by one of the political parties into the voting envelope, a “voto en blanco” campaign encourages voters to put a blank slip in the envelope as a clear protest vote, and the number of these received is published. And “La Noche en Blanco” is that blank sheet. The city provides the canvas and the people cover it with events, artistic, professional, amateur, sometimes incomprehensible, always worth watching. 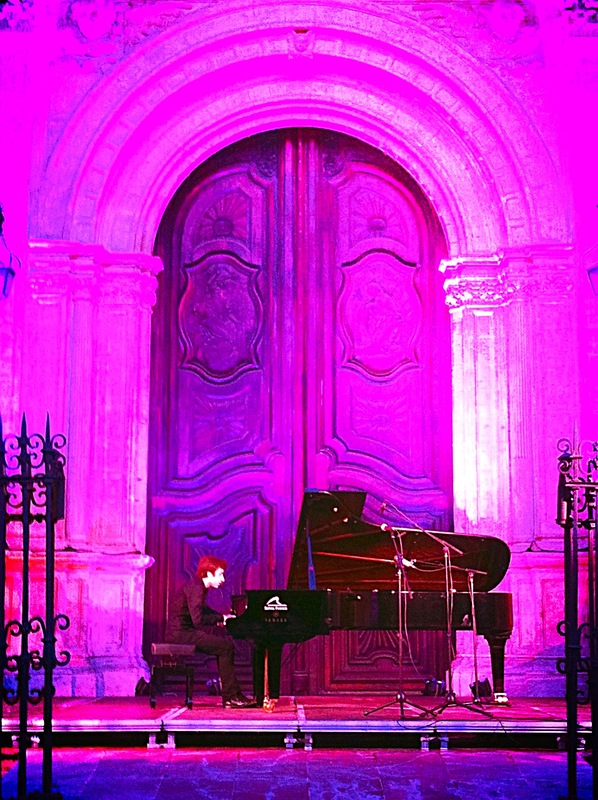 The piano outside the Bishop’s Palace, classical music outside the cathedral, queues outside all the museums, street performers entertaining the crowds, a jazz concert in the social-work college, a big stage in Plaza de la Constitución, random events in random corners, a rowing boat at the bottom of Calle Larios, and beautifully-lit jellyfish hanging above. And it’s the crowds that make it. I love to see huge queues outside Museo Carmen-Thyssen, the new Pompidou Centre, the Picasso Museum etc. Best of all, by the following day, thousands more people have been introduced to the beauty of our city’s art treasures free of charge, groups of friends, families with buggies, pensioners. The same morning, just across the dry riverbed, it was the day for distribution of groceries at Los Ángeles Malagueños de La Noche. It was blazingly hot. 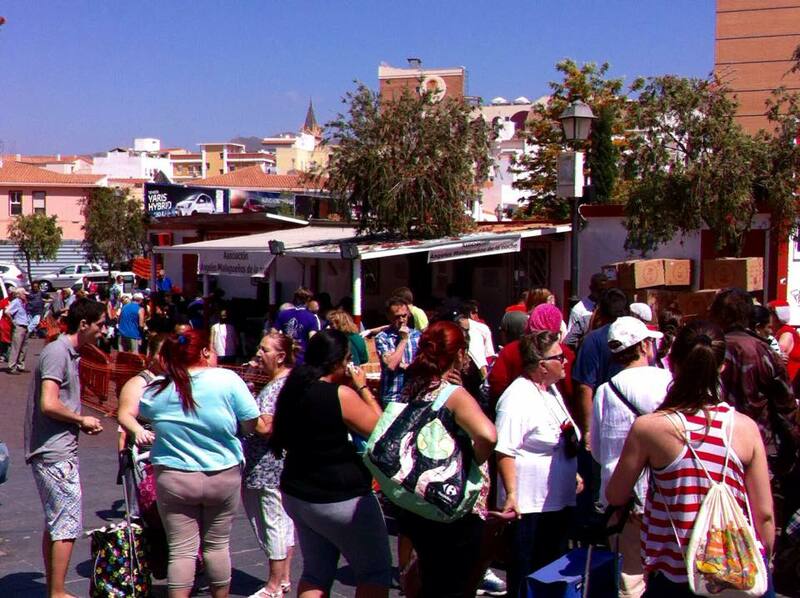 People had queued early for numbered tickets but then didn’t quite dare go far from the hot plaza beside the Ibis Hotel for fear of losing their place. The concrete square was swept, those waiting were edged back away from the Los Ángeles portakabins, long rows of tables were set up, and the stage was set. As we unpacked biscuits and bags of rice, the empty cardboard boxes were commandeered by people in the queue to fill with their treasures. Thirty volunteers lined up to give out basic dried goods, fruit, vegetables, bread, juice, shampoo etc. I was promoted to giving out bread, which was a mark of confidence from the supervisors, as one needs to be a bit firm, with everyone asking for either “pan integral” or soft rolls for children, or something else we didn’t have. Every shift I do produces the same mixed emotions. I’ve just passed the six-month mark, but haven’t completely settled with the clash between pride and relief that the organisation exists, and regret and shame that it has to exist. There’s no ignoring the inequalities in society. The delight on the faces of the people in the queue as we carefully place pasta, jam, biscuits and cartons of milk in their trolleys, makes me happy and sad simultaneously. A few days before at the Colmenar art day 70 painters, professional and amateur, descended on the village and completed a painting in a seven hours. 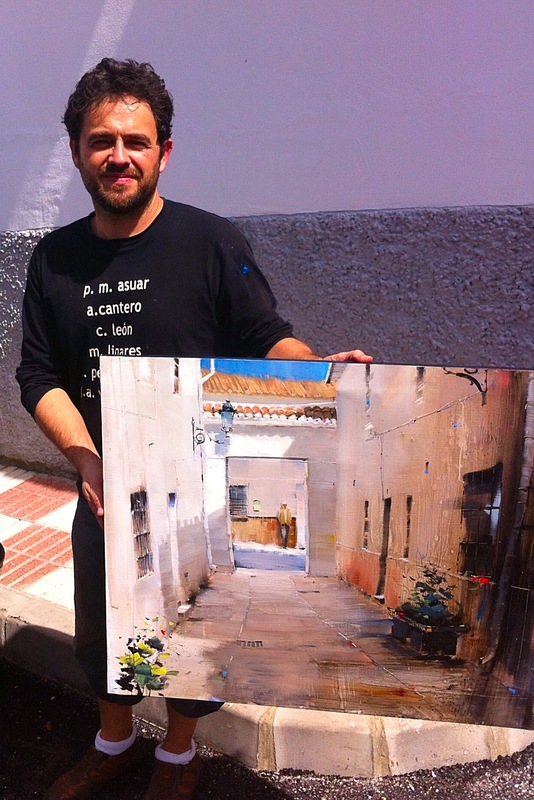 My favourite painter, Miguel Linares, took part again but I love his style so much that as he put the final touches to the oil painting of a Colmenar alleyway, we negotiated a price and I carried it home with the same care and delight with which the homeless Malagueños had carried their cardboard boxes of rice and shampoo. Things most of us don’t have to think about buying. Yes, I think twice before buying a luxury such as a piece of art, but I don’t bat an eyelid before putting pasta, honey, butter or skin-cream in my shopping bag. That’s the inequality. And the sounds of La Noche en Blanco drifted over the river to the Los Ángeles portakabins. As the evening volunteers hand out sandwiches and coffee, some of the people in the queue lift their heads to listen to the music and the laughter on the other side. 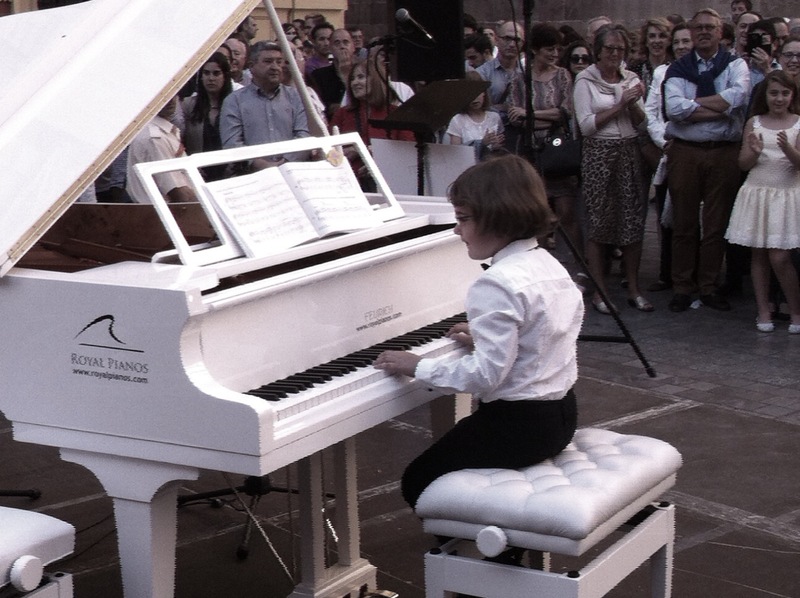 Across the dry river, Málaga was painting the town red with free culture for everyone. Or almost everyone. We’re still doing the subjunctive. Like Rome, it wasn’t built in a day. Our profe says it is impossible to argue or to love without the subjunctive, and doubly impossible to argue with someone you love without the shades and subtleties that the subjunctive makes available to us. So we’re concentrating on the verbs where the rules are not clear-cut, where you have choices. “Me parece” is one of them. “Me parece que …” is an opinion and is therefore stated as fact, so takes the indicative verb (ie normal). Me parece que no va a llover. It seems to me it is not going to rain. But adding a sentiment to the sentence, ie how you feel about it not raining, triggers the subjunctive. Me parece bien que no vaya a llover. And even “decir”, which we think is nice and straightforward, well that changes too, depending on whether the person speaking is giving information (which takes the normal, indicative verb) or seeking to influence (which takes the subjunctive). “Me dice que hace calor allí y me dice que no olvide el pasaporte”. Telling me it is hot there is information, so takes the indicative verb, but reminding me to take my passport is advice or influence, so “olvide” is the subjunctive form. And now I need to write 20 sentences to remind myself of that! 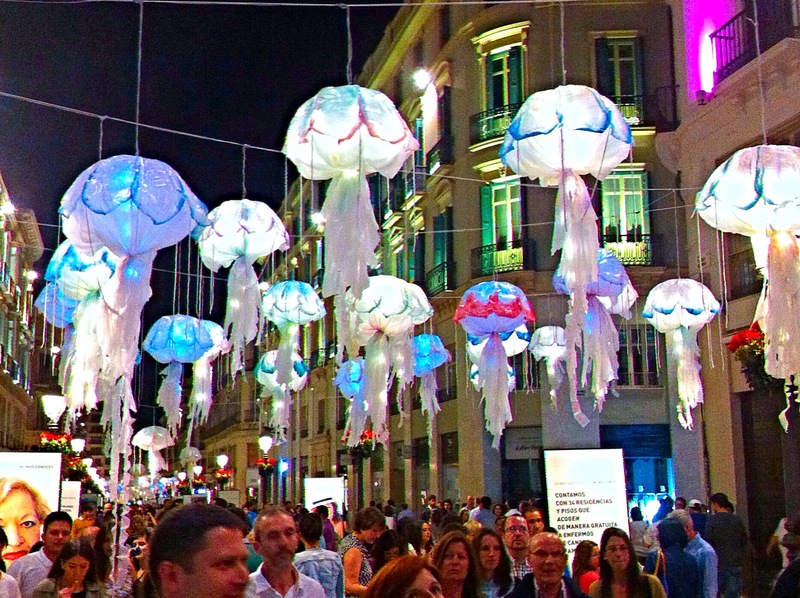 This entry was posted in Spain and tagged art, La Noche en Blanco, learning Spanish, Los Ángeles Málagueños de La Noche, Málaga by tamaraessex. Bookmark the permalink.